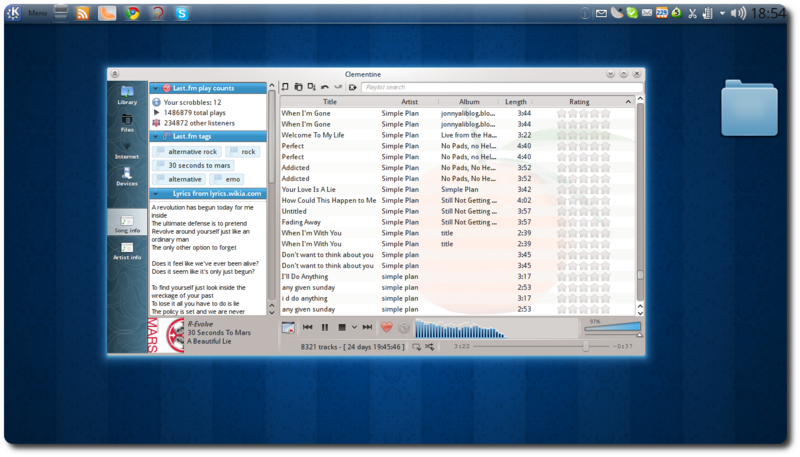 For as long as I can remember my number one music player on Linux (or in fact anywhere) has been amarok. Although, I took a little break from it during its shaky transition from 1.4 to 2.x. I came back when things got stable enough and I have not looked back ever since. Well, until recently when rave of a certain fork of Amarok 1.4 called Clementine started to proof too much to ignore. Couple of times I previously tried Clementine I went back to amarok like 5 minutes later. I found it (then) very unstable, and lacked many of amarok features like lyrics fetching etc. Recently though I have been given Clementine and amarok a fare share of play on my desktop (even though the later is still the star player (pun intended). However it seems all that might change. I was reading a blog post about the monochomization of the notification area icon of clementine in the latest development build, so I decided to give it a go to see how that would fit in with kde 4.5 systemtray icon which are also monochrome. I did not notice any different in the systemtray icon ( which was still the same ole draining orange icon. sigh) But I got an unexpected surprise inform some new features. Here are some of the new features and improvements I noticed while using the development branch of Clementine. Beside basic integrations like scrobbling, and loving tracks. It add cool features like displaying cool stats about the track you are listening to like how many times you have scrobbled that particular song to lastfm and how many times the song has been scrobbled as a whole, and how many others are listening to same track. From what I have seen so far, the next stable release of Clementine is making strong strides to becoming the Most Valuable Player on my Desktop. The Tight Integration with Lastfm and Kiss design wins it for me.